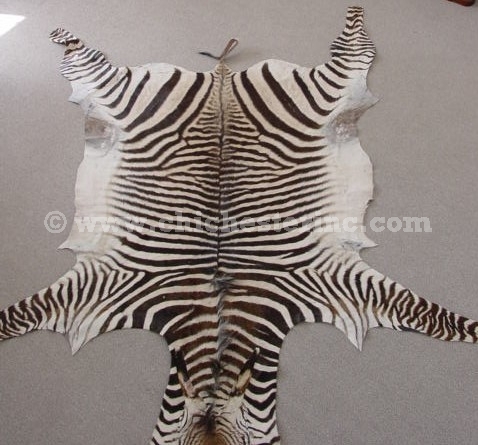 We only offer Burchell's zebras. These are not endangered and are quite common in the wild. There are more than 240,000 animals living in the wild today. See below for the difference between Burchell's and Hartmann's species. 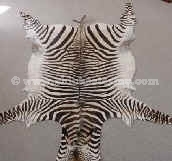 Most of our zebra skins come from government-approved herd thinning implemented to protect and encourage propagation of all species. Some of the skins are from hunters on safari. Our Gxx codes denote individual zebra skins. If you would like to order a specific skin, please go to our Galleries to pick the exact one shown. For an explanation of how measurements are derived, please click here. Burchell's zebras are not subject to CITES --the only ones we offer in the United States. Trophy Grade These are the best skins possible. Good head, good body, tail. Nice presentation. Very few flaws. Assume the top 1/10% of what is available (1 in 1,000). Everyone has a different grading system. One competitor recently wanted to buy trophy skins from us and said that she buys these for US$1,000. I laughed. One person's trophy skins is someone else's lower-grade skins. These are true trophy grade skins. First Grade Minor imperfections which are only seen upon close examination. 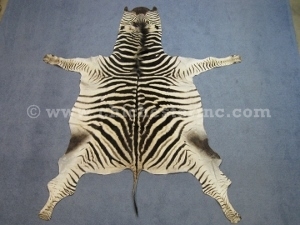 All zebra skins have rubs around the groin. Good for decoration, making ottomans and furniture. Second Grade Larger imperfections. Some are obvious from several feet away. Third Grade Repaired imperfections caused from scratches and predators. These are primarily used for craft purposes, e.g., making pillows, gun cases, key fobs, etc. An average skin weighs about seven pounds. Add two or three pounds for the weight of the box for shipping. If you want the mane to stand up, you can use a small amount of hair gel. These skins are not felted. 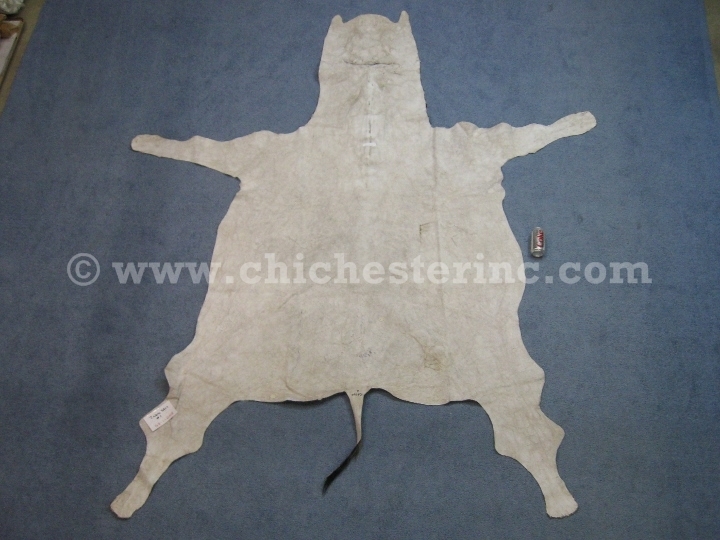 We have a taxidermist who can felt them for US$500.00 extra. Burchell's zebras are plains animals more often found in South Africa while Hartmann's zebras are mountain animals commonly found in Namibia. Burchell's require a South African export permit and a U.S. Fish & Wildlife import permit. They are not subject to CITES. Hartmann's zebras are subject to CITES and are banned from importation into the United States. 1) The nose on the Burchell's is brown/black while it is reddish on the Hartmann's. 2) The ears on the Burchell's are rounded while the ears on the Hartmann's are pointed. 3) The stripes on the Burchell's continue right around under the belly while the Hartmann's has a white belly. 4) The contrast between black and white stripes tends to be far greater in the Hartmann's than in the Burchell's. Hartmann's zebras are on the U.S. Endangered Species list and may not be imported into the United States. Most of the Hartmann's come from Namibia. Although they are exported from Namibia to most countries they are prohibited from being imported into the USA for commercial purposes. Hunters may be able to import them as trophies for personal use only. It is illegal, however, to re-sell these trophies. Please do not offer us Hartmann's zebras.